I love everything tomato. Sauced, sun dried, fresh off the vine, it doesn’t matter. I love it. I can’t get enough. Sadly, I can’t seem to get tomatoes to grow well in my garden. I miss the perfect taste of a sun warmed fresh tomato straight from the vine. Instead, I end up with a lot of sub-par Costco tomatoes. They are great for cooking but don’t pack the same punch as the real thing. While I wait to perfect my tomato growing skills, I have to come up with recipes that play up the qualities I do like about the supermarket variety. This recipe does just that. After a stint in the oven getting all sweet and gooey and concentrated in flavor, even the saddest tomato is a superstar. Add in some soft, sweet, roasted garlic and you have a great base for tons of dished. You can blend some up and add some olives and capers and parsley to make a fantastic easy puttanesca (which one of the roomies has been perfecting lately to all of our great happiness – hello pasta night!) or you pack them in olive oil and have a great snack in the fridge for later. I like to put them on my rosemary crackers with a little basil and cheese for a quick, pretty appetizer. They keep in the fridge for a long time (if you don’t keep sneaking bites every time you open the door) so it is a nice way to store tomatoes for later while they are in season. If you do pack some of the tomatoes in olive oil, you get an extra! The tomatoes and garlic will leave the oil with a pretty reddish hue and a big punch of flavor that is perfect for salad dressings or drizzling over fish (bonus points if you make pancetta and wrap the fish in that before cooking it). I don’t think the tomatoes and garlic need any extra help from herbs but it is always fun to experiment! If you want to add herbs to the jar, make sure to use sturdy ones like rosemary or oregano because more fragile ones like basil or parsley will spoil and wilt. 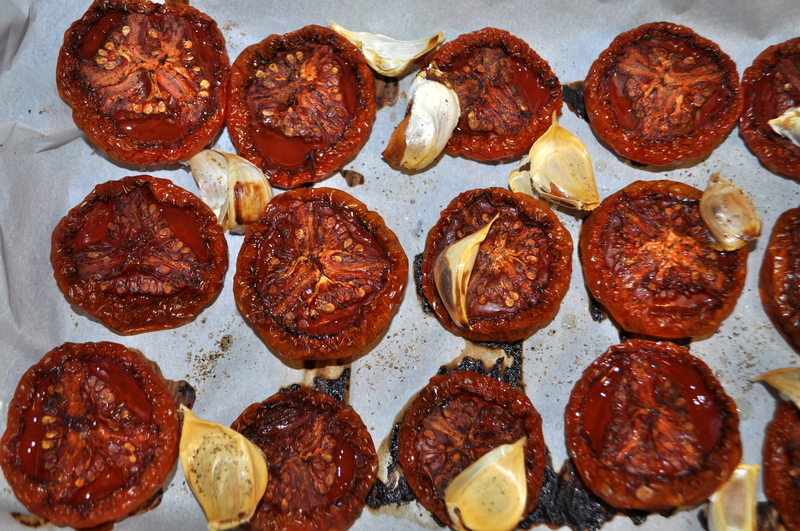 No matter how you slice it, roasting up some tomatoes is a great way to either improve less than perfect produce or store some if you are a better gardener than me and have too many! Enjoy!